I’ve had quite a few requests by readers over the past year for city guides, so this is the first in a series. In London, there are so many options that it makes sense to group some together. Also, if I leave too many out I’ll get in trouble. Probably my favourite shop in London. Very strong on knitwear, which Anda and Audie designed almost entirely themselves, and trousers, which they did entirely themselves. I recommend the Shetland sweaters, handkerchiefs and everything in linen. A trailblazer when it first opened, stocking Incotex trousers, Boglioli jackets and Common Projects trainers. Still the best shop in London for quality casual clothing with a classic aesthetic. Now with a second shop on the same street, Trunk Labs, stocking luggage, footwear and homewares. The British tiemaker’s only shop, but good for a lot more than ties. Favourites include their shawl-collar sweater, nicely styled jackets and a new, strong shirt offering. Also the only place in the UK where you can try Saint Crispin’s shoes. The only shops in the world for these top-end shoemakers. All worth a visit: G&G for the range of bespoke and ready-made shoes, and patination; Cleverley for its workshops upstairs; and John Lobb for the rabbit-warren nature of the place. Other shoe shops are less interesting or replicated elsewhere in the world. 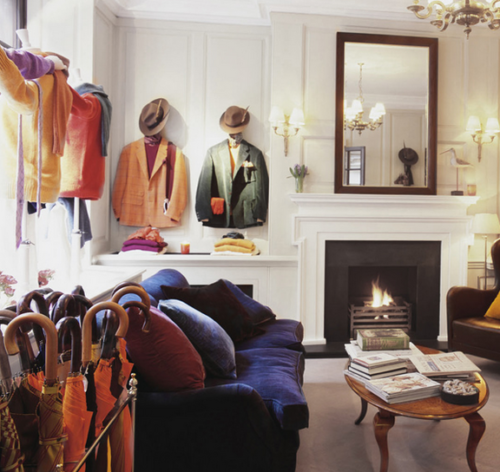 There are perhaps a dozen bespoke tailors it’s worth visiting in the centre of London. But you’re not going to visit them all, and they are not really shops – you go in for a polite inquiry, and perhaps an explanation of house style. Most are pretty welcoming. If you’re looking to commission a suit, pick out a few likely candidates. If you’re after history, visit Henry Poole, Gieves & Hawkes and Huntsman. Gieves deserves its own listing for the superb ready-to-wear clothing that Jason Basmajian has designed in recent seasons. There is also the archive on display – as mentioned above – and a nice bespoke room. A long-time British manufacturer that recently set up its own menswear line. Well-made jackets and coats at very reasonable prices, particularly distinguished by the functional aspects of the designs and copper hardware. Nowhere else in the world would you find three great hat companies in such close proximity. Lock & Co has the history, of course, and beautiful hat boxes, but if you’re actually shopping for a hat then the other two are worth visiting as well. These two casualwear brands both set up their first shops in London this year, on opposite sides of the street. Both specialise in recreations of old styles, with McCoy’s aiming for precise imitations, and Cabourn more inspiration and modern improvement. The latter also does more seasonal designs, and I highly recommend the coats and knitwear. Possibly the best shop in London for denim and leather. Stacks of imported Japanese brands, leather jackets from around the world and chain stitching on site. If you like the workwear style, also worth checking out Present and Albam in this area of east London. The scale of the Jermyn Street shop is what will impress most people. Quality menswear and accessories in almost every department, with bespoke round the corner. Getting more of a designer edge, but still with one of the broadest offerings to sartorial men in London. Across the street from Turnbull & Asser is another unique outfitter, again across two shops. In contrast with T&A, however, I would recommend N&L for the unusual – both in terms of colour and design. Few other places stock cloaks. Few have so much in green and pink. Plus the dressing gowns are beautiful. A lovely antiques store specialising in luggage, bags and men’s accessories. Run by Tim and Julian, with a well-curated and revolving collection. Recently re-housed in a new shop on Lower Sloane Street. If you simply want the greatest range of luxury clothing, Harrod’s is the best department store. But most brands in there wouldn’t get in this list. Liberty’s, meanwhile, is worth visiting for its superb perfume section. The best-curated collection you’ll find anywhere. Avoid Selfridge’s. There are a lot of shops in London, probably more than in any other city, that have their sole retail outlet in London. I wouldn’t necessarily recommend the shops for any other reason, but if you’re a fan of those brands, they are likely worth visiting. There are many, many more places in London I would recommend, but there simply isn’t room. It seems criminal to leave out Cordings, Budd shirts, Sunspel and Thom Sweeney. In fact, writing this post has made me realise afresh what a diverse and innovative menswear destination London is. Let’s hope it stays that way. Please feel free to leave your own recommendations in the comments. You can follow the discussion on London: A sartorial city guide by entering your email address in the box below. You will then receive an email every time a new comment is added. These will also contain a link to a page where you can stop the alerts, and remove all of your related data from the site. Thank you; hugely appreciated. Any quick tips on Naples as going there next week?! I don’t mean to burst your bubble, but are you aware that Italy “closes” in August? Very few, if any, places will be open! Orlebar Brown for their polo shirts. Excellent fit. Udeshi and Segun Adelaja – for accessories and shirts. Emmett for shirts and accessories. How can you recommend that tourist trap of Harrods to anyone and tell them to avoid Selfridges? What about Fortnum and Mason for men’s odds and ends. I do agree with your number 1 definitely the nicest men’s shop in town. I would add Foster and Son to your list of shoemakers for the same reason as Cleverley for its workshops upstairs. How about Ormonde Jayne, Shay and Blue and Floris for men’s fragrance? There are also the tailors such as Edward Sexton, Chris Kerr, Timothy Everest away from Savile Row to consider. Harrods is horrible in many ways, but it does have a better selection of luxury brands than Selfridge’s. Fortnum & Mason is improving all the time, but isn’t up there with any of the other big ones yet. Good call on Foster’s – and on perfume I’ve generally tried to avoid going into a full list, because you’re right there is a fantastic selection across London. Liberty’s does have an excellent fragrance section but the scents that you can’t find at Liberty’s you will find at the world’s greatest fragrance shop which just happens to also be in London: Les Senteurs. Next trip to London I have to visit the A&S haberdashery and Bentley’s. The only two I have left. Having just returned from LA, I completely agree that London has one of the most diverse range of excellent menswear shops of any city. Most of the US brands have (probably better) London outposts such as Club Monaco and J Crew, if you like that kind of thing. The only real beacon in the LA area is Unionmade, plus Fred Segal / Ron Herman can be interesting. Somewhat bizarrely, last time we were there we visited South Coast Plaza in Orange County (an escape from Disneyland..) and it has more individual watch stores and standalone stores than any shopping centre in the UK – there is even a John Lobb store, which I wasn’t expecting! Even the denim selection in London is getting close to LA. Having Budd in the whoops I forgot class is a shame; it remains one of the most underrated shops in London – and the first place to go for formal clothing. I particularly like their evening shirts. By the way how is the safari shirt/jacket you had made their lasting? You’re right, it is lovely and of course one of the few places bespoke shirt cutting is still being done on the premises. I’ve never been that much of a fan of their accessories though, compared to Drakes, A&S etc. I recently decided to start to go to the gym because I’m underweight for my height and bulking a little bit would be good for my appareance. The only downside I see is that I have many mtm shirts and jackets, I don’t plan to become “huge” but I’m worried I might not be able to wear them anymore. Have you ever been in a similar situation where you are probably having a big difference in weight and have to change your clothes? I haven’t Enzo, but it can definitely be a problem. It’s not so much of an issue when you slim down in the waist, eg by doing more cardio-vascular work, as trousers and jackets can be altered in the waist. But doing weights is an issue as you’ll change your shoulders and chest, which are much harder to alter. If you care about an exacting fit, I’d accept the fact that you might need to replace some items. Or keep the gym to mostly strength work rather than adding bulk. Simon can you give some guidance to an Aussie visiting London on the difference between the bespoke tailors? Leaner ? More modern? More classic? Are you planning to do a piece on Swaine Adeney Briggs? They seem to be a company with some great stuff and long traditions in London. I would probably add them to the list. Simon, do you know of anywhere in London that sells wide ties – specifically in 10cm (and up) widths? The only places I’ve found so far have been Tom Ford and Drakes (bespoke). You can stop by Turnbull & Asser. London is very convenient for shopping eg suits at Savile Row, shirts at Jermyn St, knitwear at Burlington Arcade etc but shop only for English iconic brands; for non-English brands, London is overpriced and I won’t bother buying non-English brands in London. Here you have the first draft of a booklet on this interesting topic. Yes, I definitly think it’s really worth considering. London is slowly but decidedly reclaiming its place as the capital of high quality menswear. And you could, even should, contribute on your part. Paris for years has taken instead the wrong direction despite being still home of very dedicated craftsmen. The other day, I saw a man amidst a wedding party standing before a Church wearing … a black suit, a black tie, and black shoes of course!.. This doesn’t happen by sheer happenstance, mind you. The question then is whether this trend has become irreversible or not. Even Stocholm (sory to my friends for picking out this city) has become a way better place in that regard over the years! So seeing these things from a broader perspective, what is happening in London is truely worth praising! Cheers John. I was wearing a beautiful old pair of heavy-linen trousers from Arnys yesterday. Unique. Such a shame. I would be tempted to include Smythson and Belstaff in that list too. Many a fine product in either emporium. Simon , what’s your view on some of the above and Internet shopping? For example , with the likes of Gieves & Hawkes , is the web store clothes of the same quality as the instore RTW? Likewise are some of the ‘Discounted Sales’ around Jermyn Street stocked with “made for discounted SALE” stock rather then geninuley discounted lines. It’s very hard to make generalisations about the made-for-sale items, even about one shop over several seasons, I’m afraid. I have seen it happen but it’s usually not consistent. On the online vs store shopping, yes you have to be careful. Gieves sells much higher quality goods in London than in its dozens of stores in China, for example, and equally Dunhill doesn’t have some of its higher-quality things online. Great list – London really does have some fantastic stores. I’d maybe add John Smedley; even though they are stocked elsewhere, the range (in the States at least) is often very limited. Not that the following belong in a top 15… but I would add Longmire to the list if it were longer – even just for a walk past their windows if already visiting St James’s/Jermyn St. If cufflinks are really your thing, Benson and Clegg are worth a look at – while theirs tend towards novelty (especially the coin ones), they aren’t many places like them. Sigh. Timing is everything. It is a wonderful list, Simon, and I would have loved it four months ago prior to my all-too-brief stay in Marylebone. Thank you, though, for at least mentioning Cordings. Several years back I visited your charming little island and made a pilgrimage to the shop. Half an hour later, across the Atlantic, SWMBO received a call from the bank advising of a large, anomalous credit card purchase in London. “Cordings,” added the representative. The wife laughed, knowingly. I often say that London is a style mecca for men and Paris is the female equivalent. The shops in London all relate to and feed off each other. There’s an infrastructure. That all brings international visitors to the city. The Royal family has also been a fantastic supporter of all those historic tailors and outfitters. On this day (the glorious twelfth), we must mention that the world’s best gunmakers are in London, historic cigar and wine merchants, art dealers, auction houses, fine restaurants and wonderful hotels (i.e. places to wear fine clothes). If you then add the social season, with Royal Ascot, The Derby, Wimbledon, Henley Royal Regatta, Cowes week, etc, you begin to see the bigger picture. It’s every discerning man’s perfect playground. Chiltern Street’s come a long way since it was home to a smattering of bridal shops and the odd big and tall boutique. Now you’ve got Trunk, Trunk Labs and a rather nifty Sunspel outpost all within a stone’s throw from each other. This is a rather lovely list you’ve put together, Simon. anybody with a passing interest in menswear would also probably enjoy a visit to Dunhill’s store off Berkeley Square, if only for the novelty of being able to get a wet shave and a burger while browsing their leather goods. Although that’s by no means unique to that store – I’ve been to their shops in Hong Kong and Tokyo and they’re equally well presented. Great list though I agree that it was criminal to miss out Budd Shirts. Not just for the shirts, but for the accessories as well. I agree with Edward. Are you still flying the flag for Crowes’ …. I like you enjoy the shop atmosphere! I agree with Adam – great to have so many individual emporia in one area. I shall be going up again tomorrow (hope the weather holds!). I’ll also be browsing in one of my favourite shops, Penfriend in Burlington Arcade. Think I’d add C&J to the list of shoe shops, but suspect you’re only listing stand alone stores. C&J often gets unfairly overlooked IMHO. Thank you sir. As always if you find any new destination for us to explore please do share. I found the Haberdashery through your posts and I don’t think I ever spent that amount of time in any store ever. Such great staff and the range is mindblowing for anyone who loves great quality. Wonderful job, Simon. The list is OH MY GOD LOOK AT THAT GORGEOUS MADDER TIE IN THE DRAKE’S AD IN THE UPPER RIGHT CORNER!!! Simon, great post! Being a northerner I was wondering if you could recommend any shops outside of London? Great article Simon and certainly your No.1 is my No.1 – if only all shops were like this! One thing that is sadly missing and is absolutely vital for those of us with a full thatch are recommendations for Barbers. For my part I’d heartily recommend PANKHURST at 10 Newburgh Street, W1F 7RN . Love this style of post Simon, perhaps a PS city guide for discerning tourists could be published? Cordings, Frank Foster, Crombie, Trumpers, Taylors of Old Bond St, Truefitt and Hill, Penhaligons, Beretta (particularly good for outdoor wear), Davidoff, Santa Maria Novella (world’s oldest fragrance maker), Floris, Farlows (fishing/outdoor equip), Dunhill, James J Fox (cigars), Foster and Son, Dege and Skinner, Ede and Ravenscroft, Richard James RTW and William Evans (shooting and country clothes) might also be added to the list. It’s a really good post. Son of Stag is the best for denim. You forgot only one for clacissism and quality of products:Real Mc Coy,a perfect japanese little shop. I am off to Milan in mid September. Would be incredibly grateful for some recs along these lines for this Italian shopping hub. Many thanks for all of your guidance on all matters sartorial – please keep up the good fight! Before my visit next Wednesday perhaps? 🙂 Fingers Crossed…Many Thanks! I first of all: many thanks for all the time and effort you spend to manage this website, and share all this great knowledge and content with us. I’m getting married next year in summer, and started to look for an appropriate tuxedo. After some initial research I decided to go for a 3 piece, midnight blue one (so a classic Henry Poole design). Ready to wear is not what I’m looking for (as I don’t think I can find a perfect one). However a full bespoke one is pretty costly, so currently I’m searching for M2M options. I spend some time informing myself at Richard James, Gieves & Hawkes and Scabal. All of them made a great impression, prices also don’t seem to vary too much. A German website also pointed me to Thom Sweeney, where I saw that bespoke as well as M2M are a little lower in price, but look great as well (at least on the pictures provided). Would be maybe my only option to go for bespoke. I’m a little lost I have to say, as this would be my first tuxedo made in England (just bought some M2M suits from German companies as well as some R2W from brands like Zegna). So my question: Who in your opinion is the best option on the ones above? Or did I miss a tailor based on your knowledge? For fragrances I appreciate there is a lot of choice but you could do a lot worse than start with a visit to Les Senteurs in Elisabeth Street or Marble Arch (www.lessenteurs.com). It is one of my favourite shopping treats in London or anywhere..
Would you add James Smith & Sons for umbrellas and sticks? Finally made it to Anderson & Sheppard’s haberdashery this trip. Absolutely lovely store, with even lovelier people working there. My favorite was a navy lambswool shawl cardigan. That’s the one I’m wearing in my piece on ‘Which office are you?’ and wrote about in the slim-fit knitwear piece. It’s wonderful isn’t it? Ah, so you are! It’s great, and the only heavier item of knitwear I own that is flattering under a jacket. Can you do another guide for Edinburgh? Going there for a weekend soon and I’d love to do some shopping. When it comes to fragrance the only traditional purveyor I can recommebd is George F. Trumper, the others have surrendered their formulations to contemporary mainstream tastes – too many synthetic aromachemicals where they do not belong. The finest curated selection of truly exquisite fragrances that comes with dedicated expert advice rather than a hard sell or hot air will be found at Bloom Perfumery just off Covent Garden. They also offer a bespoke service. I finally managed to drop into the A&S Haberdashery the other day during a business trip, and my goodness, if the shawl-collar cardigan I bought isn’t the most satisfying garment. It’s just perfect in every conceivable regard. I plan on doing some further damage at others on this list—thank you for it. Simon, I’m in the UK from the States briefly in October to see Ian McKellen play Lear at the Chichester festival. I’d love to get a bespoke suit made in London, but am only there for a week. I can come back for a second fitting. Is there any place that can do bespoke with one, or perhaps two fittings? Thanks so much for the great blog and all your advice. I wouldn’t recommend it Andrew. How about picking a tailor that also travels to New York or elsewhere in the US? Most Savile Row ones do. That way you get the experience of being measured in the London shop, but can have fittings in the US too. Thanks, Simon. Perfect solution. Is your Trunk Show calendar the best way to find out who is traveling to the States? I live in DC, but can make it to NYC easily enough. Hi Simon, this is is very useful shopping guide, I am going to London next week, could you also recommend nice vintage menswear store in London? For the permanent style stuffs, can I directly get in London instead of buying on line? Thanks! Nov 6th – Nov 13th 2018 I have a solo purely pleasure trip to London and again the second week of December. London Walks in the mornings, Sartorial pursuits in afternoons. In the past my treks have been down Jermyn street and maybe Harrod’s. I plan to visit most shops on this list these two trips. In your opinion would it be worth the trip (Day Trip) to the Northampton factory shops? I presently live in Dallas and work in the oilfield. Thanks for the quick reply.. May go anyway..
1: To get out in the countryside a bit. 2: So I don’t have to wear brown(tweed) in town. 3: I really do want a pair of Scotch Grain boots, a pair of nice Chukkas, and a single monk. All of which are rarely presented in Dallas, or a price less than full retail (Plus some) .. I have to wait until the Friday anyway to get to the Crockett Jones Factory, so I may have found what I want. I probably should do shoe shopping before visiting the the Sartorial guide list.. else I’ll need a mortgage..